Western blot analysis of lysates from various cell types using WSTF Antibody. 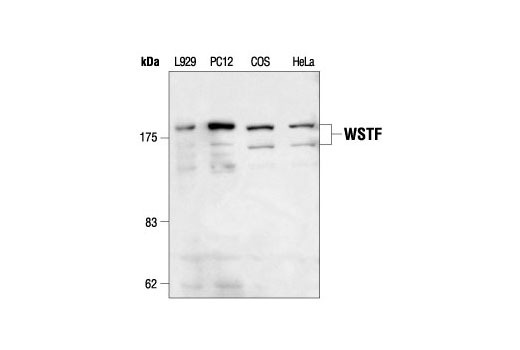 WSTF Antibody detects endogenous levels of total WSTF protein. The antibody does not cross-react with other related transcription factors. Polyclonal antibodies are produced by immunizing animals with a synthetic peptide corresponding to the sequence of human WSTF (WBSCR9). Antibodies are purified by protein A and peptide affinity chromatography. The human WSTF gene is located within the common Williams Syndrome (WS) deletion area at chromosome 7q11.23. Several WSTF gene products have been detected with little difference in length of polypeptides (1-3). Functional motifs identified by sequence-homology searches include a PHD-type zinc finger motif followed by a bromodomain. Both motifs are found in many transcription factors, suggesting that WSTF may function as a transcription factor. A Drosophila gene (acf1) was cloned, which encodes two forms of Acf1 proteins with molecular weight 170 kDa and 185 kDa, respectively (4). It was demonstrated that Acf1 is structurally related to the human WSTF gene. Acf1 forms a complex with another protein, ISWI, and functions in the ATP-dependent catalysis of chromatin assembly (4). Peoples, R.J. et al. (1998) Cytogenet. Cell Genet. 82, 238-246. Lu, X. et al. (1998) Genomics 54, 241-249. Jones, M.H. et al. (2000) Genomics 63, 40-45. Ito, T. et al. (2000) Genes Dev. 13, 1529-1539.